Founded in 1896, Rodolfi Mansueto S.p.A. is one of the oldest Italian industries producing chopped and crushed tomatoes, tomato paste, sauces, passata and tomato powder out of red, fresh, sound and natural tomatoes. Situated in the Parma region in Northern Italy, the family owned company sell their products to customers in Italy and in 60 countries around the world. 250.000 tons of fresh tomatoes are processed (e.g. washing, sorting) in a short period of two months in the summertime. High quality and reliability of all components used, is essential. A very reactive service is required, in case of technical problems or breakdown. For reasons of hygiene, sturdiness required and because of the large amount of water being used in the processing, only plastic modular belts can be used. The belts have to be durable, reliable and easy to clean. And of course they have to fulfill the strict quality and hygiene requirements and specifications of the EU. Rodolfi has installed Prolink Series 6.1 in order to have a very resistant and easy to clean belt on its tomato elevators and merry-go-round applications. The S6.1 strong longitudinal profiles allow to convey a high weight of tomatoes with the maximum reliability. The blue color of the plastic modules prevent the belts to become yellow because of the tomato acid, this guarantee even a good aesthetic result along the years. 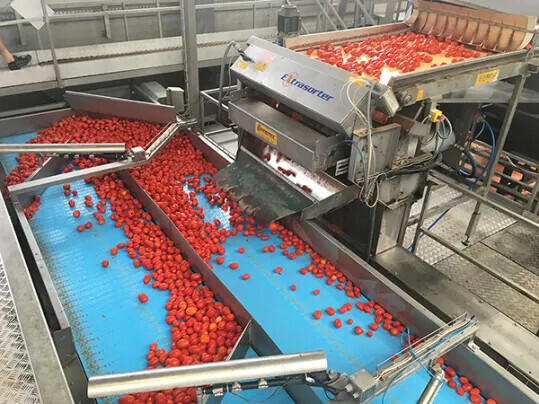 A Prolink S13 is installed inside a sorting machine to convey the tomato waste, in fact, thanks to this micropicth belt which runs on very small rollers/sprockets, it is possible to install a conveyor even in a very narrow place. Siegling Prolink has proven to be superior in terms of durability and reliability. Rodolfi is happy with our prompt and precise support and the proximity of the local Forbo Siegling service team, since this allow him to increase the efficiency of the line and reduces the production downtime. They have a positive experience with Forbo after 20 years of successful collaboration, so now we are they primary supplier and the partnership between us is intended to last over the years.